Unfortunately, with the ever growing interest in antique scientific instruments, more and more mass produced fakes and reproductions are flooding the market. This can be a costly lesson for unsuspecting buyers, as many of these instruments can look quite authentic.Some internet auction sites in particular, have many instruments advertised as genuine pieces, which in fairness are being listed by sellers who genuinely believe that the item is authentic, along with other unscrupulous sellers who will knowingly try to sell a fake as the real thing. I wish to make it clear that I do not have a problem with people selling reproductions, as long as they are clearly described as such to any prospective buyer. 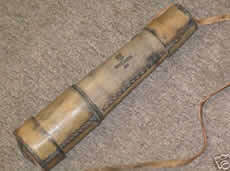 Indeed, some of the instruments are quite decorative and can display well in certain situations, but they do not represent any of the real characteristics of a genuine antique instrument. So how does one distinguish a fake from the real thing? Unfortunately, there is no substitute for experience and knowledge, but I think those of us who have already acquired such skills can perhaps guide newcomers to this field of collecting. To this end, I have created this page as a visual reference point for those who perhaps are not yet familiar with some of the replicas that are currently in circulation, many of which are cheap imports from Asia. I do come across many reproductions in the course of my collecting activities, and have decided it may benefit others if I were to list photos of these items, mainly to inform. I'm not seeking to prevent people buying reproductions if thats their intention, but hopefully ensuring that those who are looking for authentic items, can avoid the inevitable disappointment of unknowingly buying a fake. 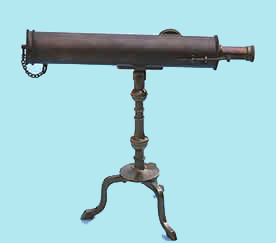 In the course of running this website, I do oblige many requests for information and valuations of specific instruments, and have lost count of how many times I've had to tell people that their 'antique' compass or telescope is in fact a modern replica from India. 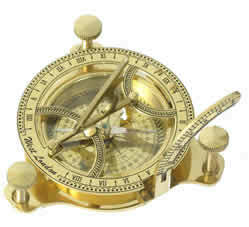 In the main, compasses and telescopes are the two main areas where reproductions are plentiful, and will often carry well known makers names, in particular Stanley. However, more recently other respected makers such as Dollond, Ross, Ottway, Hughes, are also now being copied. 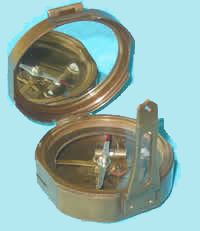 For compasses, the needle is often crudely made and may have a red or blue tip indicating North. 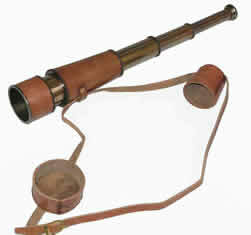 Reproduction telescopes are usually easier to spot when they have a leather cladding, as the stitching is usually very open spaced compared to authentic pieces. Also be aware that an instrument which appears to have an old patina to it, may simply have had an antique finish applied. Of course there are numerous other factors to be considered when evaluating any instrument, and it would be difficult to list all of them, so do have a look at some of the examples below and try to familiarise yourself with the overall appearance of each item, as many of the traits will be similar for different designs. The manufacturers of reproductions are constantly adding to their range of instruments, and the aesthetic quality is improving, so be on your guard! Listed below are just some examples of what reproduction instruments look like, and I will add to this gallery as I come across different types. I hope this will be a useful feature for those interested in collecting scientific instruments, and would welcome any feedback. In the meantime, if you are considering buying an instrument and are not too sure of its authenticity, do feel free to contact me and I will be happy to advise.